For the United Nations Volunteers (UNV) programme, the respect of UN core values is mandatory, especially those related to serving with integrity, professionalism and the respect of measures against sexual exploitation and abuse. 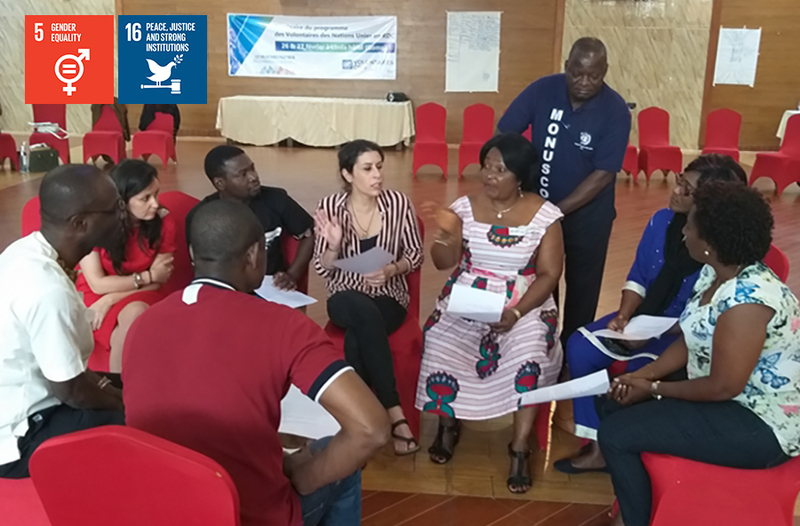 At the end of February 2019, UNV organized a capacity-building seminar for 40 UN Volunteers from 15 duty stations across the Democratic Republic of Congo (DRC) in order to reinforce their understanding of the value and potential of volunteerism to advance peace and development. Emphasis was also made, during the seminar, on the zero tolerance policy towards sexual exploitation and abuse. Daniel Marie Lushimba, Conduct and Discipline Officer with MONUSCO, supervising the group work about sexual exploitation and abuse during the learning seminar in Goma, Democratic Republic of Congo. The Democratic Republic of Congo (DRC) is a vast country with a large number of UN Volunteers (currently almost 460) serving in 25 different duty stations (including the Entebbe Support Base in Uganda). Over 80 per cent of these volunteers serve with the United Nations Stabilization Mission in the Democractic Republic of Congo (MONUSCO). The remainder serve with seven other UN agencies, funds and programmes. The workshop embraced a peer learning process that included community volunteers.Topics addressed include improving UN Volunteers understanding and application of the core values of the United Nations, especially in relation to diversity and inclusion at personal and professional levels, but also increasing participation and engagement with UNV strategic development in DRC. Before their deployment, all the UN Volunteers receive a briefing and a copy of the UNV code of conduct, which states: "In the spirit of respect for all persons, international UN Volunteers must not engage in any form of harassment, as well as all forms of sexual exploitation and abuse, as described in Appendix VI, in accordance with ST/SGB/2003/13, which shall apply to UN Volunteers mutatis mutandis". For UN Volunteers, like all the rest of UN personnel, there is zero tolerance for sexual exploitation and abuse. At the end of the session, the participants expressed their appreciation at the opportunity to get updated and acquire concrete knowledge about this important theme. The participants requested that such sessions be offered in their duty stations so that all UN Volunteers are fully informed about sexual exploitation and abuse.